Map, The County of Cumberland, scale about 2 miles to 1 inch, surveyed by Thomas Donald, 1770-71, published by Thomas Donald and Joseph Hodskinson, 35 Arundel Street, Strand, London, 1783. This is a reduced version on one sheet of the 6 sheet 1 inch to 1 mile map published from 1774. Published as a 2nd edn by William Faden, Charing Cross, London, 1810. Published in a 3rd edn by James Wyld. To The / Most Honourble / Charles Howard, Earl of Surrey. 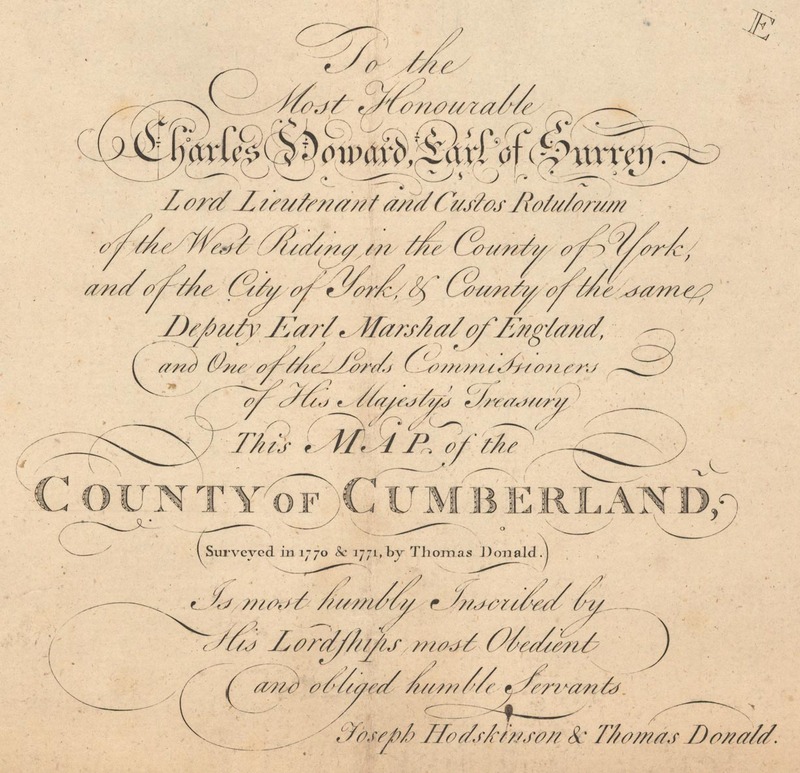 / Lord Lieutenant and Custos Rotulorum / of the West Riding in the County of York, / and the City of York, & County of the same, / Deputy Earl Marshall of England, / and One of the Lords Commissioners / of His Majesty's Treasury / This MAP of the / COUNTY of CUMBERLAND, / (Surveyed in 1770 & 1771, by Thomas Donald.) / is most humbly Inscribed by / His Lordships most Obedient / and obliged humble Servants / Joseph Hodskinson & Thomas Donald. London. Publish'd Sepr. 1st. 1783, by J. Hodskinson & T. Donald No.35 Arundel Street, Strand.